The Anglican Diocese of Pittsburgh has announced that two properties whose deeds are held by the Board of Trustees of the Episcopal Diocese of Pittsburgh have been returned to the Episcopal dioceses. A press release from the Episcopal diocese is expected shortly. The congregations of St. Martin’s, Monroeville, and Good Samaritan, Liberty Boro, left their buildings and turned over the keys at the beginning of this month. According to the notice from the Anglican Diocese of Pittsburgh, both congregations have found temporary venues for continued worship. The physical plant of St. Martin’s is substantial and includes a large parking area. 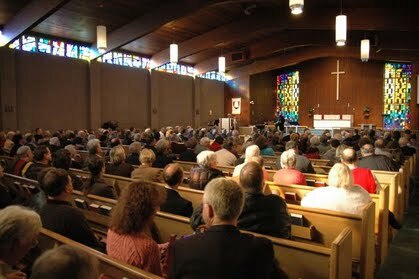 It was at St. Martin’s that the vote was taken that split the Diocese of Pittsburgh in 2008, and it has been a popular location for diocesan-wide meetings for the Anglican diocese. St. Martin’s is less than a mile and a half from the offices of the Episcopal diocese. St. Martin’s has been a declining parish for many years, tenaciously clinging to its charismatic origins. It is not well-known to Pittsburghers, though its neon sign asserting that “Jesus Is Alive” is something of a landmark along the Penn-Lincoln Parkway (I-376) from which it is easily visible. Update, 1/11/2012: The Episcopal Diocese of Pittsburgh has finally posted a story about the returned properties, which you can read here. This stuff really makes me sad. It seems to me to be a loose-loose scenario. The congregations deserved better than leaders and landlords who brought this about, in whatever proportion of responsibility. It is interesting that while the Episcopal Church has had good success in developing ministry in the more-affluent north, south, and west suburbs, parishes in the more working class suburbs to the east (Penn Hills, Verona, Monroeville, Murrysville) have struggled. Monroeville hit its high-water mark in the charismatic renewal of the 1970's and early 1980's under George Stockhowe but has struggled since, despite the efforts of pretty solid clergy and lay leadership. The property is large but poorly situated, wonderfully visible from the parkway but essentially invisible by any means of direct approach. The building itself, a hybrid of older and newer construction, has some significant problems and will be a challenge. I was a little surprised about Liberty Boro, as that seemed to me to be a likely parish to take in those of St. Stephen's McKeesport who would not want to remain at St. Stephen's in the Episcopal Diocese. It will be interesting to see how the Episcopal and Anglican dioceses describe these events. I’m not sure that the “working class” is the most natural constituency of The Episcopal Church. On the other hand, people associate with a church for different reasons. If we want to have Episcopal churches in working class areas, we need to figure out how to appeal to that population and decide whether that appeal is consistent with what it means to be Episcopalian. Anyone who knows the answer to this problem needs to step forward. As for St. Martin’s, everything you say is true. I don't disagree, Lionel, and would say that in fact the band in which the Episcopal Church can define a "natural constituency" is getting narrower and narrower. It's a view of congregational development, mission, evangelism, that is problematic of course for both practical and theological reasons. Remembering the New Jersey dowager who tells the enthusiastic young rector, "Young man, in this community everyone who should be an Episcopalian already isone." Ann Rudig from the Church Center tells us that the sweet spot for us Episcopalians now is "young disaffected Latinas." Bishop Pardue had a vision of the Episcopal Church in Pittsburgh where Hungarian steel workers would sit in the pews side-by-side with the managers and owners of the mills. If that seems a little over-romanticized, it is at least a reminder, as we see these dwindling congregations in the mill towns of the Mon and Beaver valleys, that it wasn't always simply taken for granted that the Episcopal Church was a boutique brand, associated perhaps with Whole Foods and summers on the Cape. Certainly we're going to need to think these kinds of questions through with real care in the decade ahead, as we dust ourselves off and try to discern what new and renewed work God is calling us to in this place. wooops.... they had location, location, and contemporary worship. St. Martin's, Monroeville more "working class" than St. Andrew's? The people I knew there in its heyday weren't particularly "working class." Or maybe I just didn't notice. Is there some sort of association in the minds of some between "charismatic" and "working class"? i never thought of George Stockhowe as being "working class." --However, like the Rev. Sam Shoemaker (definitely "upper crust," Princeton, old VA family with a Maryland connection, etc.--at Calvary in the 1950s and early 1960s) he "preached Christ." I'm very sorry St. Martin's got mixed up in the exit movement. We've all suffered, in my opinion, because it did. Perhaps churches like St. Andrew's continue to do well because they have leadership (like Fr. Robison) which did not get caught up in extremes of churchmanship, but above all, kept steady through the various storms. Jesus lives. When we forget to follow him things diminished. Release the word and they will come. Let People in willing to follow biblical foundation and the body will be restored. Political views need to be renounced. There is life all around mibroevile bringing people to the alternative to accept Christ. How have we lost our way. Some of these comments above are not correct. Release the property to the Lord and not doctrine. The Lord will open the well. Where Oh Where Has My ENS Story Gone?